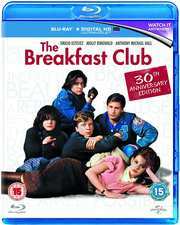 John Hughes's popular 1985 teen drama finds a diverse group of high school students--a jock (Emilio Estevez), a metalhead (Judd Nelson), a weirdo (Ally Sheedy), a princess (Molly Ringwald), and a nerd (Anthony Michael Hall)--sharing a Saturday in detention at their high school for one minor infraction or another. Over the course of a day, they talk through the social barriers that ordinarily keep them apart, and new alliances are born, though not without a lot of pain first. Hughes (Ferris Bueller's Day Off), who wrote and directed, is heavy on dialogue but he also thoughtfully refreshes the look of the film every few minutes with different settings and original viewpoints on action. The movie deals with such fundamentals as the human tendency toward bias and hurting the weak, and because the characters are caught somewhere between childhood and adulthood, it's easy to get emotionally involved in hope for their redemption. Preteen and teenage kids love this film, incidentally.